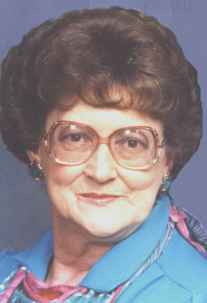 Billie Rowell, 77, passed away Sunday, January 8, 2006 at a local nursing center. Visitation will be from 6:00 to 8:00 pm on Tuesday, January 10, 2006 at The Hamil Family Funeral Home, 6449 Buffalo Gap Road. Funeral services will be at 11:00 am on Wednesday, January 11, 2006 at the funeral home. David Cason will officiate. Burial will follow at Elmwood Memorial Park. Billie was born June 27, 1928 in Ovalo, Texas to W.W. White and Mabel Earl Lee White. She grew up in Ovalo and graduated from Ovalo High School. After high school she attended business school. She was a member of the "Ovalo Ex's". She married D.C. Rowell in Breckenridge, Texas on November 22, 1986. He preceded her in death on June 22, 2005. Billie was a native of the Big Country and a member of Broadview Baptist Church. She is survived by two sons, Robert L "Bob" Faulkner of Abilene, John Faulkner and his wife Terry of Abilene; one daughter, Kay Harris and her husband Beaver, of Abilene; one step son, Randy Rowell and his wife Audra of Abilene; two brothers, Roy E. White and his wife Bonnie, of Abilene, Alfred P. White and his wife Pat, of Irving; and seven grandchildren, Brandye, Ginna, Rusty, Abby, J.W., Kortni and Kelci. She is also survived by several nieces and nephews. Memorials may be made to Hospice of the Big Country, 4601 Hartford St., Abilene, TX 79605, or Broadview Baptist Building Fund, 2500 South 7th, Abilene, TX 79605.